It tells the time, super accurately. The proof point is lining up several Apple watches next to each other; the second hands are always in perfect sync. You can see the time in the dark, just looking at your wrist. Stupidly simple, I know. When a notification comes in, you get tapped on the wrist. Feeling the device do that to you for the first time is one of the things that gives someone their first “oh” moment; when I demo the watch to anyone, putting it on their wrist and invoking the heart Taptic pulse is the key feature to show. Outside of message notifications, having the “Dark Sky” app tell me it’s going to rain outside in 5 or 10 minutes is really helpful. I pay for stuff using my Nationwide Debit or Credit cards, without having to take them out of my wallet. Outside my regular haunts, this still surprises people to this day; I fear that the take up is not as common as I expected, but useful nonetheless. I know it’s monitoring some aspects of my health (heart rate, exercise) and keeps egging me on, even though it’s not yet linked into the diet and food intake site I use daily (www.weightlossresources.co.uk). Being able to see who’s calling my phone and the ability to bat back a “busy, will call you back” reply without having to drag out my phone. The demo in an Apple Store doesn’t major on any of the above; they tend to focus on aesthetics and in how you can choose different watch faces, an activity most people ever do once. On two occasions while waiting in the queue to be served at an Apple Store, someone has noticed I’m wearing an Apple Watch and has asked what it’s like day to day; I put mine on their wrist and quickly step through the above. Both went from curiosity to buying one as soon as the Apple rep freed up. I rarely if ever expose the application honeycombe. Simplicity sells, and I’m sure Apple’s own usage stats would show that to them. 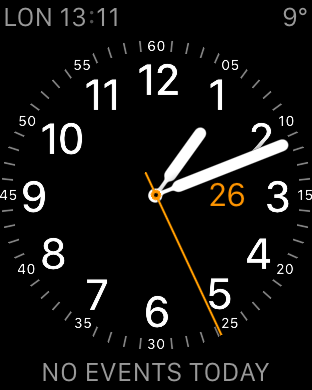 I also find Siri unusable every time I try to use it on the watch. In the final analysis, an Apple Watch is a Low Energy Bluetooth enabled WiFi hub with a clock face on it. Having more folks stringing other health sensors, in addition to ones on the device itself, to health/diet related apps will align nicely with future “self service” health management trends. Being able to tone down the ‘chatty-ness’ of notifications. I’m conscious that keeping looking at my watch regularly when in a meeting is a big no-no, and having more control on what gets to tap my wrist and what just floats by in a stream for when I look voluntarily would be an asset. When driving (which is when I’m not wearing glasses), knowing who or what is notifying me in a much bigger font would help. Or the ability to easily throw a text to voice of the from and subject lines onto my phone or car speakers, with optional read back of the message body. Siri. I just wish it worked to a usable standard. I hope there are a few Amazon Echos sitting in the dev labs in Cupertino and that someone there is replicating its functionality in a wrist form factor. So, the future is an eclectic mix between a low energy Bluetooth WiFi hub for health apps, a super accurate watch, selective notification advisor and an Amazon Echo for your wrist – with integrated card payments. Then getting the result easily integrated into health apps and application workflows – which I hope is what their upcoming WorldWide Developers Conference will cover.